If you are planning to build a new home, place a mobile/modular home or cause other development in Wayne County, you are required to obtain a Building Permit. Residential permits are $15. Fines for building without a permit can be up to $50 per day. Applications can be obtained at the Courthouse or by calling the Building Permit Office at 272-6350. Permits must also be secured for sewage disposal and well construction. If you are building in a designated floodplain you will be required to certify your plans to meet certain elevation and flood resistant construction requirements before the permit can be approved. These provisions are necessary to meet the minimum requirements established by the National Flood Insurance Program and the Federal Emergency Management Agency. Proper placement and elevation of new structures can save homeowners and developers on flood insurance premiums and minimize flooding damage on their investments for years to come. Shown above is a portion of a Flood Map. 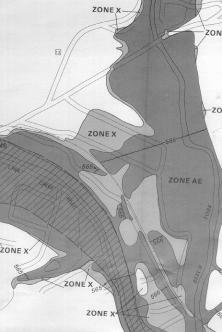 The shaded areas on the map indicate areas that have been zoned as Special Flood Hazard Areas. SFHAs are the flood zones that have the greatest risk of flooding. They are darkly shaded areas on the maps. During a 30-year mortgage, there is a 26% chance of flooding in these areas and only a 4% chance of fire in the same period. Development is permitted in these areas; however restrictions apply to the height of the floor of structures above the flooding, proper anchoring and foundation construction. If you have a question or would like to have a map that shows your property and its location with respect to the Special Flood Hazard Areas, call the Building Permit Office in Wayne. These maps can be emailed, faxed or mailed to you at no cost. CALL THE BUILDING PERMIT OFFICE BEFORE YOU BUILD!!! Permits are required before placing mobile or modular homes and before building new homes.